Two 2-week deployments at the Billia Croo (BC) wave site were carried out (typically 3–5 m wave height). The first in a tidally influenced area with up to 3.5 m/s spring tides. The second was at a non-tidally influenced area of the wave site with up to 1.5 m/s spring tides. 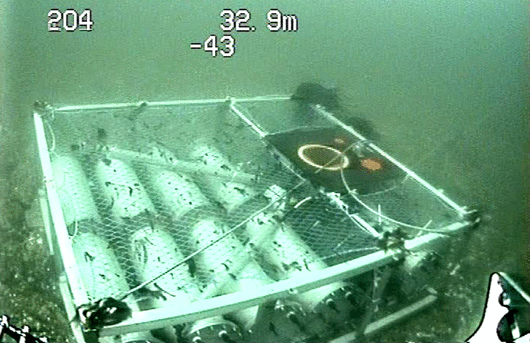 The FLOWBEC device was deployed at the tidally influenced site from 10 Jul – 24th Jul 2013 and at the non-tidally influenced site from 27 Jul – 12 Aug 2013. The FLOWBEC platform had a WET Labs ECO FLNTUSB fluorometer positioned with an upwards orientation. The fluorometer measures turbidity and fluorescence, which can be used as a proxy for phytoplankton. The fluorometer provides contextual data on biomass/productivity in the water column testing the hypothesis formed at the EMEC tidal energy sites that the advection of productive water masses into the area may signal the arrival/presences of many other species. Measures of turbidity/visibility can be used to predict the perceptual range of animals that may impact and predict the behaviour of species around devices. Continuous over each fourteen day deployment (3 deployments) which covered the full spring-neap cycle. EMEC Billia Croo FLOWBEC Fluorometer Monitoring Data is located in United Kingdom.